500 gm. 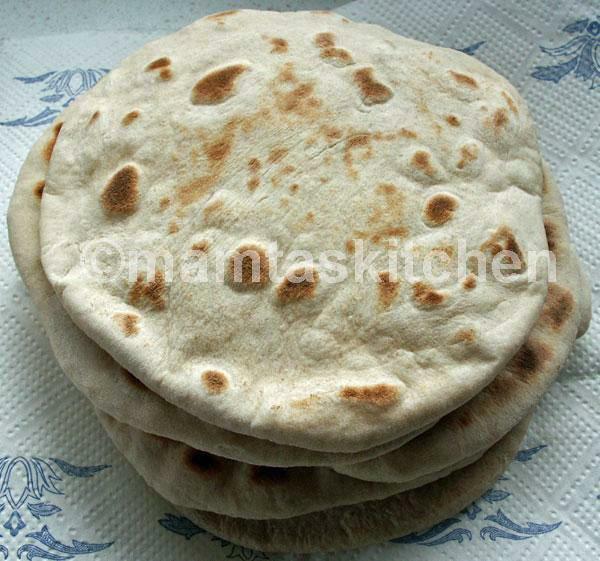 (2-2 1/2 cups)atta or chapatti flour (If you can not get this, mix 2/3rd plain white and 1/3rd whole-wheat flour. 100% white flour can also be used. 1 tsp. kalonji/kalaunji/nigella (nigella sativa). These are optional. Mix flour, yoghurt and seeds together. Make a soft dough. It has to be soft enough to roll out, not too firm to make it difficult to roll. Remember that soft dough makes for softer rotis. Keep aside for 10-15 minutes. Then give it a quick knead, to make it smooth. Heat the oven to 250º-300ºC or 400º-475ºF, whatever is the maximum it will heat to (*see notes). Leave the oven tray in the centre of the oven to get it really hot.It needs to be hot to be able to cook the underside of the roties well. Break off 5 (or as many as will fit on your oven tray at a time) golf ball size portions. Roll each ball out gently to a 6 inch circle, using dry flour for dusting the roti on both sides as needed. Remember to roll out from centre out, so that centre is always thicker than the edges, otherwise they will not fluff up. When the first batch is cooking, you have enough time to roll out the next batch. Take out the tray from the oven, quickly place the rolled out rotis on it and bake in the centre of the oven for 8-10 minutes. How many trays you can use at a time depends on the size of your oven and heating efficiency. The oven must remain hot. Roties fluff up into balls, so keep space between trays. Once the top looks cooked; very lightly golden with a few dark brown-black spots and patches, turn over and check that the other side is also cooked. You will need to keep an eye on the roties in the oven, while you are rolling out the next batch, as they can burn easily if left even for 20 seconds extra. Or stack them and wrap in a towel. They are best served straight out of the oven. If made for using later, slightly under-cook them and re-heat under hot grill or in a toaster just before serving. They can be stored stacked and wrapped in aluminium foil or in an airtight roti container/box. This will keep them softer. Cooking in a tandoor; Tandoori roties should ideally be cooked in a 'Tandoor', but most of us do not have one at home. See pictures. For variations, you can add chopped garlic, fenugreek (methi) leaves, chopped coriander leaves, green chillies, coarse red chillies etc. to the dough or roll them like a filling, as in Stuffed paratha. In Punjab, potato stuffed parathas are traditionally made in a tandoor oven.